When Alyssa, from Mookology, approached us about being a Guest Crusader, we jumped at the chance. Mookology is a great blog to visit where you can read all about movies that are based off books. Her reviews are always well thought out and detailed, this girl knows her stuff! Today she is switching gears for a moment to share her thoughts on a recent visit to Cupcake in Heels, a cupcake shop located in the Bayside neighborhood of Queens in New York City. We hope this is just the first of many Guest Crusader reviews from Alyssa! When I’m not writing, reading, and watching films for my blog, Mookology, my absolute favorite past time is eating and baking cupcakes. Living in one of the New York boroughs has its perks, and baked goods are definitely one of them, so you can only imagine how excited I was to taste the cupcakes at Cupcakes in Heels in Bayside, New York. 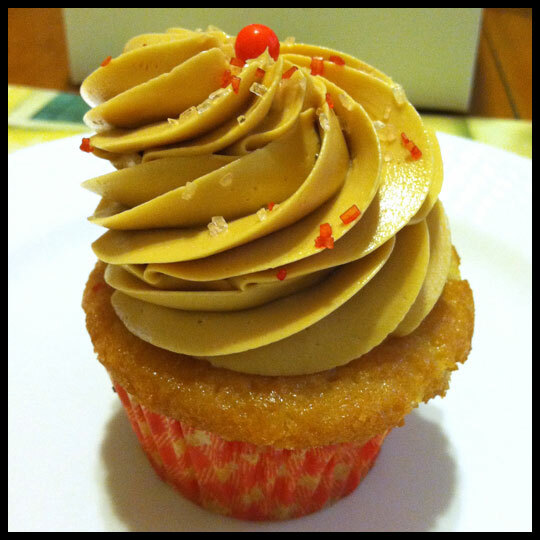 I found a Living Social coupon for Cupcakes in Heels for 3 cupcakes and a cup of coffee for (wait for it) $6! Within seconds the coupon was purchased and I was waiting for the opportune moment to try some cupcakes. Knowing I couldn’t (well.. shouldn’t) eat 3 cupcakes by myself, I brought along my sister to Cupcake in Heels with me. They had a nice selection of flavors, all adequately named after prestigious fashion designers. Although the coupon only bought 3 cupcakes, we decided to get one extra to make it even (and because we couldn’t decide on just 3 cupcakes). Our first cupcake was the Prada cupcake. This was a Pistachio cupcake with whipped pistachio frosting. 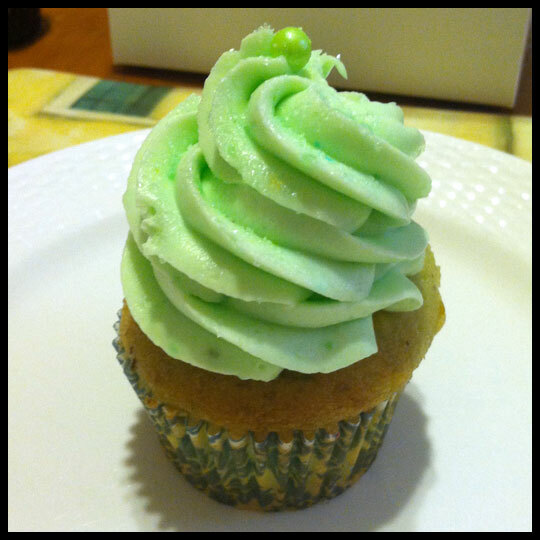 I am a sucker for pistachio desserts and was dying to try this cupcake. It did not disappoint one bit! The cake was moist and filled with pistachio bits and the frosting was light, fluffy and tasted just like a pistachio ice cream. We literally ate every last crumb of this cupcake! The second cupcake we tried was the Balenciaga, a Tres Leches cupcake with a dulce le leche buttercream. Since the Prada cupcake had set the bar incredibly high, we were expecting a light and delectable Tres Leches cupcake. This cupcake was just okay. When I think of Tres Leches, I think of moist yet light and airy cake, but this just tasted like a regular cupcake. There was nothing too special about it. The dulce le leche buttercream was also missing something. Although it was very light and fluffy, I wanted more of that caramelized flavoring dulce le leche is known for. In general, this was just a good cupcake. 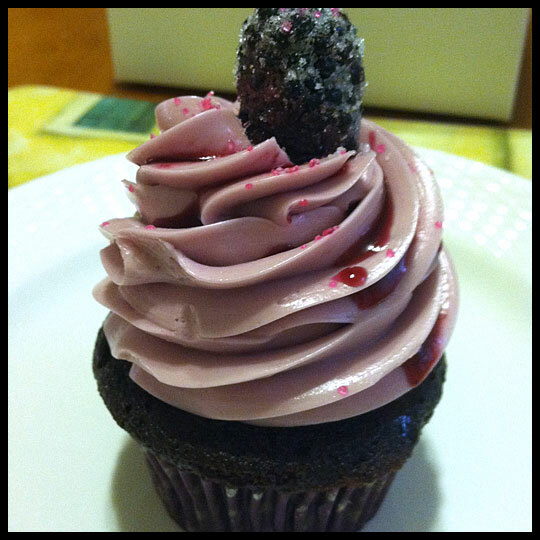 The third cupcake we tried, the Vivienne Westwood, was a red wine, blackberry and chocolate cupcake, filled with blackberry & red wine frosting, frosted with a red wine buttercream, and drizzled with red wine and blackberry syrup. I was eager to try this cupcake; the combination of red wine and blackberry sounded very appealing to me and I love to try something different. However, this cupcake wasn’t very fulfilling. The red wine and blackberry syrup was a little bit heavy handed on the red wine part and its distinct fermented flavor interfered with the rest of the cake. The cupcake could have used a little more sweetness. It was almost bland. 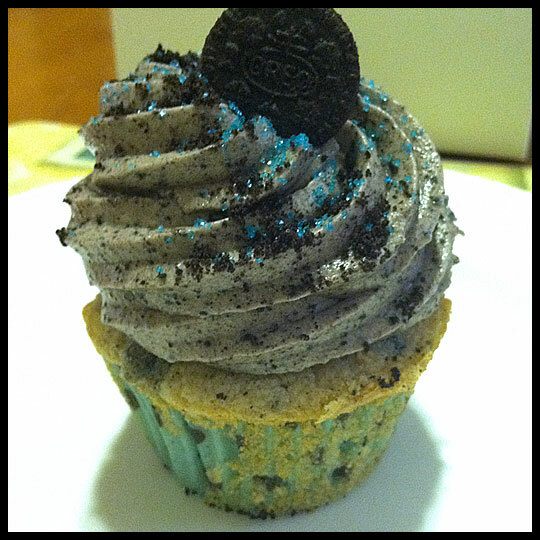 Last, we tried the Stuart Weitzmen, a cookies and cream cupcake with cookies and cream frosting, baked with an Oreo cookie inside. I was looking forward to biting into a rich, chocolatey cupcake but this cake was incredibly dry compared to the others and a major disappointment. However, the cookies and cream frosting was incredible. It tasted exactly like the frosting of an Oreo cookie, mixed with chocolate cookie crumbs. The frosting definitely made up for the dryness of the cake. I would definitely go to Cupcakes in Heels again and try a few more cupcakes; the pistachio cupcake alone gives me high expectations. The coffee here was surprisingly good also! I went with an iced coffee rather than hot, and was delighted to see that the actual ice cubes were frozen coffee cubes – pretty smart! The décor in Cupcakes in Heels was adorable and they had a few cupcake-themed knick knacks available for sale as well. This entry was posted in Cupcakes, New York, NYC and tagged Balenciaga cupcake, Bayside, cookies 'n cream, Cookies and Cream, cookies and creme, Cupcake, Cupcakes in Heels, Dulce de Leche, New York, NYC, pistachio, Prada cupcake, Queens, red wine, Red wine and blackberry chocolate, Stuart Weitzmen cupcake, Tres Leches with Dulce de Leche frosting, Vivienne Westwood cupcake by Stacy. Bookmark the permalink.